Experience the vibrant life of downtown Chicago at its most exciting and beautiful time of year! Let Inside Chicago Walking Tours take you on an enchanting stroll through the heart of the city at its prettiest time — during the winter holiday season. And you'll be happy you took this tour with its special musical performance at the end! On this "architecture lite" tour, we visit the most beloved and festive spots in downtown Chicago, enjoying the beautiful decorations and lively atmosphere, and learning about Christmas and other holiday traditions of Chicago's large multicultural community. 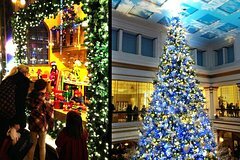 We will weave our way through the hustle and bustle of the Loop, walking down famous State Street ("that great street," as Frank Sinatra called it), popping into the old Marshall Field's to check out the huge Christmas tree, and much more! NOTE: This tour is "architecture lite": rather than learning a ton of information about architecture and history like we do on our regular tours, which are also available, this tour is meant for the simple enjoyment of the city's prettiest spots during the holidays. You won't find a boat, a bus, or even a segway where we're going. Come and take a holiday stroll with us — it's a fun stress-buster and perfect time to set aside for hanging out with family and friends!